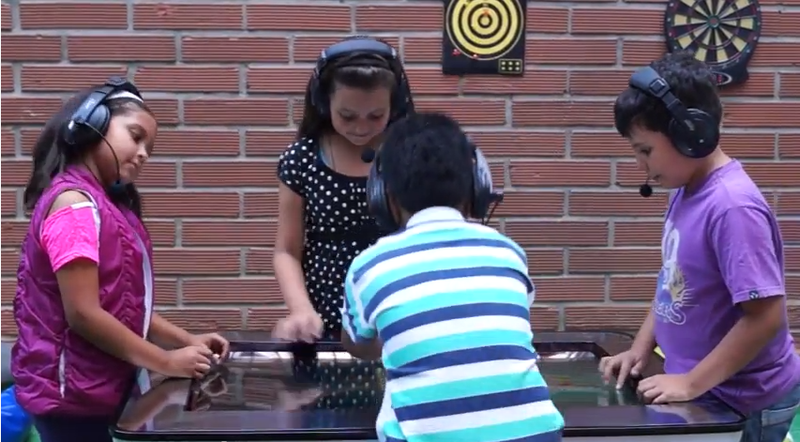 Can you imagine 4 kids playing on this table, interacting online with each other and at the same time, learning? This is exactly what MiMU is all about. This is one of my favorite projects at INNGENIO presentation, because it’s going to revolutionate the way kids learn, share and prepare for this collaborative world we are living in. MiMU is the last product of Aulas Amigas, a company that reaches high schools, middle schools and elementary schools in order to transform learning experiences through the use of cutting edge technology at low costs, educational content and the engagement of teachers that will guide students in a new era of education, as written on their LinkedIn profile. It is 40″ interactive table with touch screen, designed to promote collaborative learning through specific apps and contents according to different areas and development levels. There can be up to 4 kids at the same time, with independent sound and the possibility t save the work kids have built. I invite you to watch the video, is in spanish, but it’s fine, just amaze yourself with the future of learning. This entry was posted on March 8, 2013 by jmarinsi in Cases and tagged App, Education, interactive table, Startups, Technology.